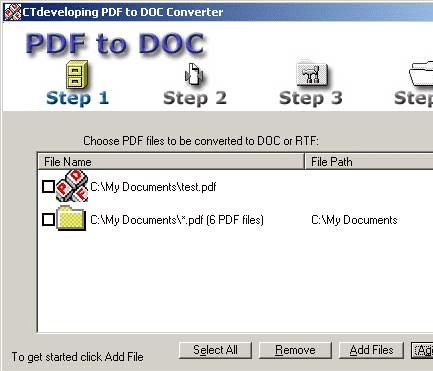 PDF to DOC is used to convert PDF files to Word (.doc) or WordPad (.rtf) documents in batch mode. It works without Adobe Acrobat or Adobe Reader, and has friendly interface, small size, accurate and fast conversion ability. It retains the original text, images, format and layout of PDF files in the output doc/rtf files during converting. Also, PDF to DOC supports converting the password-protected PDF files and specifying page range to convert. Key features: Friendly interface, small, accurate, and fast. Working without Adobe Acrobat or Adobe Reader. Supports converting PDF files to Word (*.doc) and WordPad (*.rtf) documents both. Retains the original text, images, format and layout in the output doc/rtf files. Supports converting PDF files in batch mode. Multithreaded converting to make it to be fast. Supports converting the password-protected PDF files. Supports specifying page range to convert.